Risk is a key challenge for any organisation and one aspect that family firms do struggle with is brand and reputation, especially when the family name is above the door. In the world of family business, there is often a focus on the long term and many owners of multi-generational family firms will tell you that they see themselves very much as ‘custodians or stewards of the business for future generations.’ It is natural then that as a whole, they tend to be more risk averse than their non-family counterparts and like to ensure that key areas of concern are addressed and planned for. However, the world is changing and there are more and more challenges that businesses need to take account of – from reputation and brand management to ethical trading, responsible sourcing, and of course the increasingly high profile cyber, political and tax risks. Risk is a key challenge for any organisation and one aspect that family firms do struggle with is brand and reputation, especially when the family name is above the door. Family businesses use their brand as a way to create trust and research suggests that family firms tend to be more respected and trusted because of the family involvement, an involvement that may have been around for many years, if not generations. In our new ‘technological world’ social media can create instant results but there are also significant risks around the wrong messages getting out and the brand and reputation being damaged. Some families in business do struggle with balancing the benefits from embracing social media and the significant risks around the wrong messages getting out and the brand and reputation being damaged. Strategies are adopted to manage the risk and minimise the damage but this itself may risk under-achievement, especially from campaigns involving social media and promotional activity where there is a reluctance to fully engage and put the brand out there. In most cases the family is the brand and the two are intrinsically linked, but when it comes to the risk element, the families that tackle the challenge collectively, agreeing a strategic approach and creating a shared voice, are best placed to succeed. Whilst it is apparent that social media is not readily appreciated or understood by some of the older generations, they are well versed in the ‘old style’ communications like PR. Sharing things that have worked well in the past; the business and family values, tone of voice, and the brand presence they want to be seen helps the social media practitioners to continue to promote and talk about the family firm in the same light. It is also important to have formal procedures to manage the risk, somebody responsible to check social media interactions and is ready to respond appropriately – to deal with complaints and challenges. In fact, family firms that deal with these issues as they arise, and respond quickly, taking them offline as appropriate, are better placed than those without procedures and people in place to do so. Like anything, brand is something that can be managed, as can the risks, but there needs to be a strategy in place to do so. 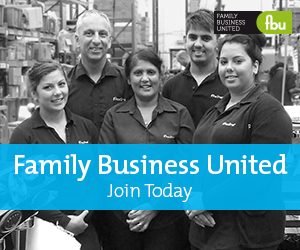 Families in business have a real advantage, the family and their involvement, something that needs to be protected and nurtured, but also can increase the impact of the marketing and promotional activities when used in the right way, enhancing the credibility of the organisation and providing a story to the business too. Families may be less inclined to take risks than their non-family counterparts but the challenges around technology remain. Cyber security and risks associated with doing business today are very real, and like social media and reputation, a key area of concern for all businesses. These risks are real. Families in business need to accept that the risks are out there, to evaluate them and the impact that they can have on the business and develop a strategy to minimise their impact should anything happen. Managing risk is important and with evolving technologies and the speed of communication moving onto social media platforms, family firms should look at developing appropriate strategies to manage the risks as they are not going to go away, and failure to develop plans is going to potentially expose them to the risks, the very risks that as a family they don’t want to take on.